Understated and elegant, this linen duvet cover set from Roxbury Park transforms your bedroom into a restful refuge. Each neutral, monochromatic set pairs well with almost any sheets, and subtle ridged detailing adds a restrained hint of texture. 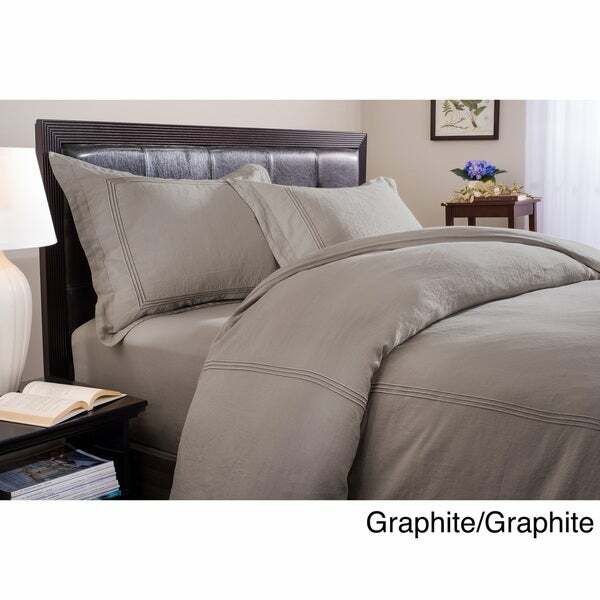 This versatile linen duvet cover set also comes with two pillow shams, so you can outfit your bed instantly. I really love the fabric and color, it just needs to be a few inches wider to really cover the mattress. Better used as a dishrag! I wanted a nice linen duvet cover to go with my linen sheets. The linen is very poorly woven, and the color is very off. I ordered the ivory shade but it's more of a dirty yellow - not attractive at all. Unfortunately, this item is not returnable. (I don't know why..) Probably the last time I order from this website. I got the prairie/prairie and it is beautiful. Of course, it arrived wrinkled and I was dreading having to iron it but it ironed beautifully with very little effort. It is well made and the linen is high quality and very soft. My 24 yr. old son came over and slept in the guest room. He insisted on taking my brand new duvet and I have just ordered another! You won't go wrong if you are looking for quality, comfort and a great color. Softened up really quickly! i LOVE IT! I washed it in my standard top loader as soon as I got it, dried it on low for a few mins, and while still damp, I hung it to dry. I was surprised that hanging it to dry was enough to make it less wrinkly (but it only lasted until we slept in it the first night-which i think isn't a con, but just a uniqueness of linen). The first night, I was like: uh oh, i had seen how nearly every review praised how soft it was. but it was rough and stiff the first night. did i even get the same product?! it softened up noticeably EACH night I slept under it, and now, after about 2-3 weeks, I'm in LOVE! it's a whole 'nother duvet compared to when I first got it! it's got texture, so don't expect cotton sateen-texture. but i love it, even against my face! another reviewer said it was like a dishrag. unfortunately, i don't think she even gave it a chance... this has cooled down our primaloft comforter noticeably and pretty much eliminated getting overheated and sweating at night! if you find your current comforter too hot, you might not need a new comforter at all! maybe just a new duvet cover! fyi, the previous cover that made me sweaty at times was cotton/lyocell blend. I also love how the comforter "floats" above us. i love scrunching it up and hugging it! lol so as far as linen goes, it's definitely not going to be top-notch, crazy expensive italian-made quality, so do have realistic expectations. but it definitely will give you the linen experience of breathability, "loftiness", and it just washes up really well. just don't over dry it in the dryer, it will shorten its life. also another note, if you're trying to decide between this and the linen set made by that popular swedish affordable flat pack furniture retailer...this is better quality. that one has a lot more little knots in the fabric, and might have a looser weave as far as i can tell. the only down side is i don't know how well the embroidery will hold up. it's well done, but probably not going to be as sturdy as the linen part...so it might be the first to show wear. in any case, I highly recommend this. =) i got the graphite on graphite, love the color! its a beautiful grey. no weird surprises there...like the picture. Linen speaks for itself. cool/hot as needed. I have had duvet covers in the past and found that the button closures work less effectively when there down from the top about 10 inches or so. they show the inside down comforter and come undone more easily, then the ones that button right at the top. This feature is much better and I was pleasantly surprised to see this duvet set done this way. you can easily grab the top and comforter inside and shake it down back in place in one step. Wrinkles, yes, but it seems to work with town/country feel linen bedding provides. This bedding is beautiful in quality and design the colour is sophisticated and I love it! Beautiful linen duvet cover and shams that work great for a man or a woman. The perfect shade of grey, no blue or green undertones. One of the best purchases I have made on Overstock. This is a REAL linen duvet. The entire duvet is linen, not just one side and not "faux" linen. My bedroom decorating style is a French/Restoration Hardware/Veranda. Lots of muted grey, taupe, cream. The linen duvet looks fantastic and fits the style of the bedroom perfectly. I was worried that the duvet would feel rough because I have always thought new linen is a bit rough but this duvet is super soft. It looks new but has a soft fresh feel. I highly recommend it and plan on purchasing one for each bed in my home! Comparable to Restoration Hardware linen duvet. Nice fabric weight, lightweight and breathable for those hot Texas nights. The Prairie Duvet and pillow cases are perfect! The linen is soft and the prairie color, though it isn't as golden as one of the pictures, is a lovely soft taupe - actually the color I was hoping for. This set is so like *** linen sets and you can actually coordinate them. I am very pleased!! Duvet set was perfect for my needs. Duvet set and other accessories were as pictured. Delivery was handled efficiently. I'm very haooy with my selection. The quality seems to be very good. I have just taken it out of the package and put it on the bed. It fit my king size comforter perfectly. I'm using it on twin beds pushed together in my guest room. It's a perfect fit, hanging down the right length on all sides. I will need to buy a bed skirt and the measurement to the floor is 16" which is also perfect. I am very happy with the color, it looks just like the photo. I haven't used it yet so don't know about wrinkling or washing but all in all I'm very happy. I came very close to buying the Restoration Hardware set for way more money. Not to put down RH, their products are top quality, I just didn't want to spend that much money for a seldom used guest room. This is a good compromise. This is the first product I ever had to send back to Overstock. The linen was nice and soft but the ivory color was not ivory on the duvet but more of a pale yellow. I also ordered the matching euro in the ivory color and it was actually ivory... so it did not match the duvet. I think this set would be great in a different color but would not recommend the ivory color choice. Although it is a gorgeous set, I should have known here that linen means real linen, not linens. Real linen means this product wrinkles very easily and MUST be pressed after washing. It wrinkles if you lie on it. Just beware of the high maintenance aspect. If you dont mind this, then you will be happy with the set. After receiving an email asking if I wanted to cancel my order, because it would not be shipped out on time, I was disappointed, but decided to wait it out. When it finally did ship, the shipping took FOREVER, but I was so excited to receive my "Prairie" duvet with ivory stripes. Unfortunately, I had the unpleasant surprise of opening my package to see an ivory duvet with prairie stripes! I realize that I am sounding a bit dramatic here, but this was my first attempt at investing in some quality bedding and it was not cheap, people!!! Pay very close attention to the colors when ordering... do not be mislead like myself. Overstock needs to do a better job clarifying the color names! Aside from the shipping & color disappointments, the quality of the linen appears to be good. If the color had been right, I would have kept it. Love the color and quality, very nice and a great price. I purchased this set quite awhile ago. It has held up nicely even with light machine washings. Although a bit pricey, it was the comfy relaxed style I was looking for. Beautiful linen duvet! Super soft. Very nice quality and perfect color! This is a really beautiful linen duvet cover set. It looks much more expensive than it is. If you are looking for a perfectly pressed look, this is not it. It is definitely 100% linen. I have loved my linen cover. The buttons are high quality. I love linen. I think the look is unmatched. I love the soft fluffy vibe it gives with the down comforter. Feels inviting. "Will you get more of these in? I am looking for a Queen set in the Graphite color. I see you have others but I have bought this before and love the quality." We do not know if the graphite in Queen will be restocked. "Is this item returnable? Someone said the ivory is yellow...thoughts?" Hello leathera, we try to represent the colors of our products accurately. Unfortunately, due to the difference in monitor colors we cannot guarantee that the color will match exactly what you see on your screen. Items in new condition can be returned. Please see the following link to view the full return policy (https://help.overstock.com/app/answers/detail/a_id/1/c/1). Thanks for shopping with us! I purchase the Prairie color first and it wasnt right for me. I exchanged it for the graphite and loved it! They honored my request no problem. "does the king fit a California King and if I need to return, do I have to pay for shipping to send it back?" "I recently purchased a white duvet corner from another company, had it monogrammed in red, hence I have red accents for the bed.... Will the red - Pottery Barn Red - go with this? I need for it to look classy and very House Beautiful! We also have 2 small dogs who are on the bed as well and need to know if it will stand up with them too." Hello Msmckinn, we can appreciate the fact you want a firsthand account of the product. You will receive an email notification every time you get a response. I personally feel the two colors will look great together. Thank you for shopping with us. I have been searching for a rustic, but romantic theme bedding set for our nedroom. Im hoping this will work perfectly. The hotel look but not white. "I see that European shams are available for this product. Could I swap standard shams for European ones?" Hello smorley, Unfortunately we cannot separate the sets, the euro shams would have to be purchased separately. Thanks for shopping with us. "Does the king duvet come with king shams or standard?" Under "Details" tab and "King Dimensions" it shows the measurements of king size shams.